Having recently watched all 5 seasons of Friday Night Lights in what I can only assume is record time, I went back to the 2004 movie that predicated this excellent TV show. This American football picture is directed and co-written by Peter Berg; star of Wes Craven’s Shocker and cousin of H. G. Bissinger, who wrote the non-fiction book on which the film is based. The movie follows the Permian High School Panthers’ 1988 season, led by coach Gary Gaines (Billy Bob Thornton). The question in sports movies is always: why should we want these overzealous maniacs to win over the other set of overzealous maniacs? Friday Night Lights answers this question by making us care about the characters, set against a backdrop of economic deprivation and domestic unrest; a template invented by Sylvester Stallone in Rocky. To lend the true story extra authenticity, Berg shoots with a vérité style that puts you firmly on the pitch with these spirited young men; a sense of immediacy boosted by clever editing, visceral matches and strong performances. 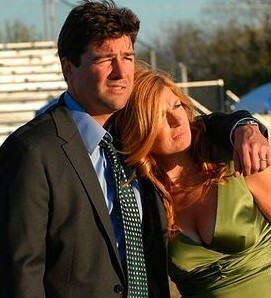 Though having seen what Connie Britton is capable of in the show, one realises that her talents are wasted in the film. And good as Thornton is, one can’t help but miss Kyle Chandler. It’s not necessarily the performances we miss, but the staggering level of characterisation achieved by the TV show. The protracted nature of the series allowed for rich, layered development of characters that I grew to care for more than I care about most characters or indeed real people. No such attachments can be made in the movie, which is basically a result of the time constraints inherent in feature film-making. Nevertheless, watching the film after the show (admittedly the wrong order) feels like a considerable comedown. The TV show isn’t really about football; the film very much is. And I literally could not care less about American football. So although it’s a good sports movie, Friday Night Lights pales in comparison to the terrifically human series (or soap, if we’re being honest) that followed. One can see why Berg chose to further explore these themes, characters and settings on television: because there were more stories to tell.